The Outsmarting of Criminals by Steven Rigolosi, a Mysterious Review. Review: Recovering from her first mugging in New York City, Miss Felicity Prim decides that she needs a change. 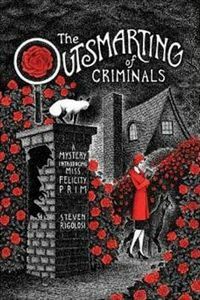 Quitting her job in a doctor's office, she opts to become "a cozy criminal outsmarter, living in a lovely cottage with a garden, in a town where nothing truly bad happens", in The Outsmarting of Criminals, the first mystery in this series by Steven Rigolosi. She finds the perfect cottage on an acre of land to purchase in Greenfield, Connecticut. Quickly naming it Rose Cottage, she sets out to cross the next item off her list: adopt a canine companion. A boxer named Bruno catches her eye in the animal shelter. "You will not walk away from me," Bruno seemed to be saying to her, "for you are a person of impeccable taste and judgment, and you know a good thing when you see it." It isn't too much longer before she is presented with her first case as a criminal outsmarter, when she discovers a secret panel that opens to a staircase leading to a basement she didn't even know she had. And in the middle of the underground room lies the quite dead body of a man. When the police arrive and investigate the scene, they discover something puzzling: eight sets of footprints coming up and going down the dusty stairs, but also a ninth set of footprints coming up, but not going down. "We've been assuming that the murderer dumped the body in the basement," says Miss Prim. "If the killer carried the victim downstairs, there should have been a set of footprints going both up and down." "Exactly," replies Detective Dawes, "which means, Miss Prim, that we have a locked-room mystery on our hands." The Outsmarting of Criminals is an absolutely charming mystery, with nearly every element of the book, from the cast of characters to the small town setting to the cleverly crafted plot itself, just about pitch perfect. And while Miss Prim takes a measured, quite thoughtful approach to solving the murder (as one would expect of a criminal outsmarter), she soon finds herself in harm's way … but from a completely unexpected source. Start to finish, The Outsmarting of Criminals is a thoroughly enjoyable mystery; readers will be eagerly looking forward to the next in the series. Acknowledgment: Ransom Note Press provided a copy of The Outsmarting of Criminals for this review.